Meet Anthony. He’s a Paterson native and a father of two boys. He loves writing, comic books, and hanging out with his family. Anthony has spent most of his adulthood working in warehouse operations and enjoys the challenges that come with it. He never graduated high school, but Anthony has always worked hard, done well for himself, and provided his family with everything they need. One day, everything changed for Anthony. After 14 years with his employer, he became a casualty of budget cuts and lost his job. The news turned his whole world upside down. To get by, he worked odd jobs and late nights, but couldn’t seem to find a steady position. As time passed, Anthony’s savings started to run low and he had to budget carefully. Soon, his worries turned into panic. For the first time in his life, Anthony was struggling to make ends meet. On top of all his training and development, we’re thrilled to share that Anthony was also able to move into a new apartment with his family recently. At first, he was worried about the move. Anthony and his sons had been staying with some family until they could get back on their feet. Living on a tight budget, he wasn’t sure if he would be able to afford the additional expenses that come with living on your own. Teresa, our Community Closet Manager, helped ease his fears. When she heard about Anthony’s dilemma, Teresa provided him with a new mattress, box spring, couch, table, chairs, kitchenware, dishes, and other essentials. Additionally, our team helped transport the items to Anthony’s new place to make the move a little easier. Anthony is still getting settled in his new place, but he says that CUMAC helped make his apartment feel like a home, and that’s something he will never forget. When Anthony first joined the Pathways program, he will tell you that he was quiet and discouraged. In many ways, the trauma of the last couple of years kept him from imagining a brighter future. He often felt like giving up, but the CUMAC team was always there to give him the boost that he needed. For Anthony, that support was vital. As the months have passed, we’ve seen him flourish. “The team has been pushing me, encouraging me, and that’s really helped me to spread my wings” he says. “I feel like I’ve grown a lot. CUMAC has really helped me break out of my shell.” With more confidence in himself, Anthony continues to take on more responsibility around the building and impress our team with his abilities. Along with supporting our day-to-day operations, he now helps train new Pathways members, and even leads groups on various projects. Pathways to work is providing our neighbors with the skills and resources they need to thrive. Thank you for making programs like this possible. 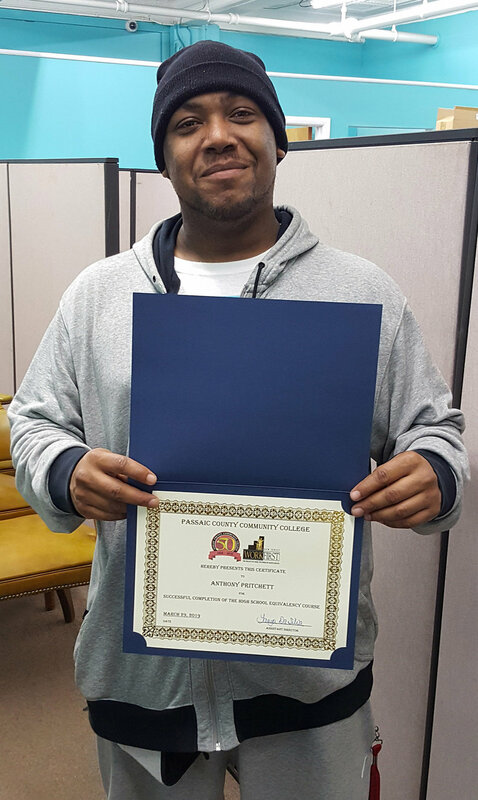 STORY UPDATE: We’re happy to share that Anthony passed his HiSET exam and has earned his high school equivalency diploma! Anthony is now dreaming big about his career and we couldn’t be more excited. With his talent and work ethic, we know that he has a bright future ahead. Way to go, Anthony!